The walls are infected, the foundation is diseased…this house is poisoned. CORE agent, Hudson Patterson and his wife, Eden, recently moved into a century-old mini-mansion. But their dream home has become a living nightmare—occupied by a malevolent spirit who will only share the residence with them and their daughter…in exchange for their souls. Psychic Celeste Kain is four weeks away from giving birth. The last thing she wants to deal with is the dead. But when she realizes an evil presence is terrorizing Eden, she will go to any length to help her sister. Especially when she discovers there isn’t just one ghost in Eden’s house, but many other tortured souls trapped within its infected walls. 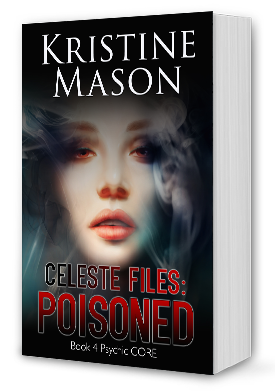 To put an end to the haunting, Celeste uses her unique gift to connect with the ghostly residents. But the wicked entity who has been feeding off the other spirits’ pain and misery has other plans. It wants Celeste and her unborn child, and imprisons her inside the ghost house. Now powerless, unable to free herself and in labor, Celeste needs to fight to find her way back to her body before the entity can take what it wants…her baby.